The use of glutamate-modulating drugs for neuropsychiatric conditions is emerging as an alternative to three decades of use of dopamine-, serotonin-, and gamma-aminobutyric acid (GABA)-modulating drugs in neuropsychiatry.1–4 While such use is still nascent in clinical settings, there is promise of significant impact on improved outcomes for patients. Research in genetic epidemiology and neurophysiology is pinpointing glutamate, the essential excitatory central nervous system (CNS) neurotransmitter, as a direct target for pharmacologic manipulation. In this selective review, we present current drug trial data in disorders that exhibit features of a lack of inhibitory control, including cognitive (obsessive–compulsive disorder [OCD]), motor (Gilles de la Tourette syndrome [TS]), behavioral (attention deficit hyperactivity disorder [ADHD]), and grooming (trichotillomania [TTM], excoriation disorder [ExD]) domains. Abbreviations: N, number of patients; NA, not applicable; SSRI, selective serotonin reuptake inhibitor; ERP, exposure–response prevention; IV, intravenous; bid, twice per day; NAC, N-acetylcysteine. Amantadine (1-adamantanamine hydrochloride) is an antiviral drug that was formerly, but no longer, used for influenza prophylaxis.37 Its current uses are to improve alertness and arousal in post-traumatic brain injury in children,38 improve executive dysfunction in patients with Alzheimer’s dementia,39 and treat the early stages of Parkinson’s.40 The mechanism of action is thought to consist of releasing dopamine from the presynapse, in addition to possible negative modulation of the NMDA receptor.41 While it can be neuroprotective due to its glutamate antagonism properties, amantadine has also resulted in acute neuropsychiatric side effects such as hallucinations and confusion.42 A case study reported that a treatment-refractory patient with OCD responded to amantadine (200 mg/day) added to clomipramine (225 mg/day).43 In an open-label study of amantadine in eight patients with OCD who had failed one SSRI trial,44 Yale–Brown Obsessive Compulsive Scale (Y-BOCS) scores improved for compulsions (15.3±3.2 versus 10.6±4.7; P<0.02; degrees of freedom [df] =7; t=2.36) and obsessions (12.7±3.3 versus 8.1±5; P<0.05; df=7; t=2.36). Memantine (3,5-dimethyladamantan-1-amine) is a noncompetitive NMDA receptor antagonist with neuroprotective properties in cortical neuron cultures74 and in humans.75 These properties propelled its use in Parkinson’s disease,76 Huntington’s disease,77 and Alzheimer’s disease.78 The same glutamate-modulating property has motivated the assessment of memantine in OCD. Abbreviation: N, number of patients. Animal models in TS have been fraught with the innate complexity of modeling specific motor movements (tics) in nonhuman species. A working animal model will depend on the physiological assumptions about tics; for example, deficient gating has been proposed as a mechanism for propensity to tic expression based on premonitory urges associated with tics. The prepulse inhibition (PPI) of the acoustic startle reflex-deficit animal model is used to demonstrate deficient gating, and although not specific to TS, it can be used to explore pharmacologic options for tics.134 An alternate animal model relies on D1 receptor variants that drive glutamatergic neurocircuitry excitability; a mouse model displays compulsive-like repetitive behaviors.135,136 Interestingly, in these animal models, PPI is disrupted by the chemically-induced antagonism of D1 receptors in the medial prefrontal cortex (dopamine mechanism) and NMDA receptors in the ventral hippocampus (glutamate mechanism).137 These models suggest complex interactions in the cortical–subcortical neurocircuitry that involve dopamine and glutamate influences, along with a decrease in PPI. Ketamine, a high-affinity NMDA receptor antagonist, has been found to increase PPI levels, making it a plausible drug to ameliorate tics. No direct trials of ketamine in TS are available; therefore, data on the effect of ketamine on PPI are reviewed. To measure the cognitive and PPI effects of ketamine, 20 ketamine-naïve subjects with negligible baseline startle responses were given either a placebo or a dose of ketamine of 0.23 mg/kg over 5 hours, followed by ketamine 0.5 mg/kg over 1 hour. A significant increase in PPI levels was detected in the active drug group.138 In another study with 16 healthy patients, researchers found that subanesthetic doses of ketamine significantly increased PPI.139 In both trials, experienced cognitive effects resembled those seen in schizophrenia, but PPI levels were increased by ketamine rather than decreased, as seen in schizophrenic patients, suggesting utility in disorders with abnormal levels of PPI. A retrospective chart review146 of 41 patients with TS who were administered topiramate (mean dose: 150 mg/day) for an average of 9 months, suggested that this drug could be effective for tic management. In this case series, topiramate was used as the primary monotherapy in 21 of 41 patients, while concomitant medications included neuroleptics (11/41), clonidine or guanfacine (6/41), tetrabenazine (3/41), and botox (3/41). Over 75% of subjects had “moderate to marked improvement” of tics. The main adverse effects were those common to topiramate: cognitive–language problems (25%) and aggression/mood swings (10%).146 A single 10-week, randomized, double-blind, placebo-controlled, parallel group study compared topiramate versus placebo in 29 patients with TS.147 The main outcome, “total tic score”, significantly improved in the active drug group (14.3 [SD =10.5]) compared to placebo (5.0 [SD =9.9]) (P<0.05). YGTSS motor, vocal, and total tic scores were significantly improved in the active drug group compared to placebo. No difference in adverse events was noted between the two groups.147 To date, topiramate constitutes a second-line agent in the management of clinically impairing tics. Abbreviations: N, number of patients; NAC, N-acetylcysteine. Recent trials of amantadine in pediatric populations have included its use in autism and ADHD.41 In an early open-label trial of amantadine, eight children with ADHD 10–13 years of age were taken off stimulant medication and provided with amantadine 100 mg bid for 1 month. While two children had similar responses as they had to methylphenidate, most only had an intermediate response compared to methylphenidate.186 A 6-week, open-label trial187 using amantadine 50–150 mg on 24 stimulant-naïve children with ADHD aged 5–13 years showed superiority over placebo. Only one child could not complete the trial due to headaches, and another had a transient decrease in appetite. Up to 60% of children had a >25% response in parent ADHD ratings, and 50% by teacher ratings.187 A head-to-head 6-week comparison trial188 of amantadine (100–150 mg/day) versus methylphenidate (20–30 mg/day) among 28 boys and 12 girls with ADHD aged 6–14 years showed no difference between the two drugs. Parent ratings showed 55% were responders on methylphenidate and 50% on amantadine; the teacher ratings were 35% responders for methylphenidate and 30% for amantadine.188 From these trials, amantadine has a modest effect in treating ADHD. Given its primary glutamate-modulating action, amantadine may be useful in treating symptoms of ADHD in specific subgroups of affected children. A retrospective case series of 40 adult patients aged 16–55 years with ADHD comorbid with bipolar II or recurrent depression was conducted to gauge the effect on ADHD symptoms.189 Most patients (38/40) were on methylphenidate as well. With lamotrigine doses ranging from 25–250 mg, CGI scores were improved over the 48-month follow-up span.189 Antiepileptics can worsen attentional performance, and surveys can been conducted to assess these detrimental effects. In one survey on newly diagnosed childhood absence epilepsy, valproate, but not lamotrigine or ethosuximide, worsened attentional performance.152 Overall, lamotrigine improved cognition and attention in 24 of 45 children receiving lamotrigine for seizure control in one study,190 and the improvement of ADHD symptoms with lamotrigine does not appear to be dependent on ameliorating seizure activity.158 Given its benign to favorable cognitive profile, clinicians have advocated using lamotrigine as the antiepilepitc of choice when seizures are comorbid with ADHD.191 Currently, only indirect evidence supports the use of lamotrigine for the management of ADHD symptoms in children. The pathophysiology of OCD-RD has been investigated; however, much work needs to be done to further clarify their relationship to OCD. There are indications of increased familiality in TTM199 and ExD,200 suggesting a genetic diathesis. A lack of motor inhibitory control, such as in the Go–NoGo task in TTM201 and in the stop–signal task in ExD,160 point to an underlying neural inhibitory network deficit. Positron emission tomography studies show an increase in mean global metabolism in TTM compared to controls, as well as normalization of increased orbitofrontal and anterior cingulate regions with clomipramine treatment.202 More recently, and paralleling neuropsychological inhibitory deficit findings, a white matter tract study of subjects with TTM found reduced fractional anisotropy (white matter disorganization) in the anterior cingulate, presupplementary motor area, and temporal cortices,161 as well as increased mean diffusivity in the fronto–striato–thalamic white matter tracts.203 In ExD, analogous white matter disorganization is also found in areas associated with inhibitory control, such as the tracts emerging from the inferior right prefrontal regions.204 These pathophysiologic changes suggest a neurocircuitry imbalance in inhibitory neural control systems (Table 4). Abbreviations: OCD, obsessive–compulsive disorder; N, number of patients; NAC, N-acetylcysteine; TTM, trichotillomania; ExD, excoriation disorder. An open-label, 16-week trial of topiramate 50–250 mg/day in 14 adults with TTM resulted in nine adults completing the study.212 Trial completers had a significant reduction of hair-pulling behaviors, with 6/9 classified as responders. Five patients dropped out due to adverse effects.212 In a model of ExD using patients with PWS, topiramate 50–150 mg/day was administered as an add-on for the management of self-injury. All three patients experienced a significant resolution of ExD within 8 weeks of initiating the topiramate trial.213 Another case report214 noted that two adolescents, aged 15 years and 16 years, with autism spectrum disorder and significant ExD symptoms benefited from topiramate addition to their psychotropic regimen in doses up to 200 mg/day for 12 weeks. Merritt K, McGuire P, Egerton A. Relationship between Glutamate Dysfunction and Symptoms and Cognitive Function in Psychosis. Front Psychiatry. 2013;4:151. Hashimoto K, Malchow B, Falkai P, Schmitt A. Glutamate modulators as potential therapeutic drugs in schizophrenia and affective disorders. Eur Arch Psychiatry Clin Neurosci. 2013;263(5):367–377. Musazzi L, Treccani G, Mallei A, Popoli M. The action of antidepressants on the glutamate system: regulation of glutamate release and glutamate receptors. Biol Psychiatry. 2013;73(12):1180–1188. Coyle JT, Basu A, Benneyworth M, Balu D, Konopaske G. Glutamatergic synaptic dysregulation in schizophrenia: therapeutic implications. Handb Exp Pharmacol. 2012;(213):267–295. American Psychiatric Association. Diagnostic and Statistical Manual of Mental Disorders. 5th ed. Washington, DC: American Psychiatric Association; 2014. Leckman JF, Grice DE, Boardman J, et al. Symptoms of obsessive-compulsive disorder. Am J Psychiatry. 1997;154(7):911–917. Ruscio AM, Stein DJ, Chiu WT, Kessler RC. The epidemiology of obsessive-compulsive disorder in the National Comorbidity Survey Replication. Mol Psychiatry. 2010;15(1):53–63. Heyman I, Fombonne E, Simmons H, Ford T, Meltzer H, Goodman R. Prevalence of obsessive-compulsive disorder in the British nationwide survey of child mental health. Br J Psychiatry. 2001;179:324–329. Craske MG, Treanor M, Conway CC, Zbozinek T, Vervliet B. Maximizing exposure therapy: an inhibitory learning approach. Behav Res Ther. 2014;58:10–23. Pediatric OCD Treatment Study (POTS) Team. Cognitive-behavior therapy, sertraline, and their combination for children and adolescents with obsessive-compulsive disorder: the Pediatric OCD Treatment Study (POTS) randomized controlled trial. JAMA. 2004;292(16):1969–1976. Rosenberg DR, Keshavan MS. AE Bennett Research Award. Toward a neurodevelopmental model of obsessive – compulsive disorder. Biol Psychiatry. 1998;43(9):623–640. Luján R, Shigemoto R, López-Bendito G. Glutamate and GABA receptor signalling in the developing brain. Neuroscience. 2005;130(3):567–580. Martin LJ, Furuta A, Blackstone CD. AMPA receptor protein in developing rat brain: glutamate receptor-1 expression and localization change at regional, cellular, and subcellular levels with maturation. Neuroscience. 1998;83(3):917–928. Furuta A, Martin LJ. Laminar segregation of the cortical plate during corticogenesis is accompanied by changes in glutamate receptor expression. J Neurobiol. 1999;39(1):67–80. Sattler R, Tymianski M. Molecular mechanisms of glutamate receptor-mediated excitotoxic neuronal cell death. Mol Neurobiol. 2001;24(1–3):107–129. Grados MA, Specht MW, Sung HM, Fortune D. Glutamate drugs and pharmacogenetics of OCD: a pathway-based exploratory approach. Expert Opin Drug Discov. 2013;8(12):1515–1527. Rosenberg DR, MacMaster FP, Keshavan MS, Fitzgerald KD, Stewart CM, Moore GJ. Decrease in caudate glutamatergic concentrations in pediatric obsessive-compulsive disorder patients taking paroxetine. J Am Acad Child Adolesc Psychiatry. 2000;39(9):1096–1103. MacMaster FP, O’Neill J, Rosenberg DR. Brain imaging in pediatric obsessive-compulsive disorder. J Am Acad Child Adolesc Psychiatry. 2008;47(11):1262–1272. Arnold PD, Sicard T, Burroughs E, Richter MA, Kennedy JL. Glutamate transporter gene SLC1A1 associated with obsessive-compulsive disorder. Arch Gen Psychiatry. 2006;63(7):769–776. Stewart SE, Fagerness JA, Platko J, et al. Association of the SLC1A1 glutamate transporter gene and obsessive-compulsive disorder. Am J Med Genet B Neuropsychiatr Genet. 2007;144B(8):1027–1033. Dickel DE, Veenstra-VanderWeele J, Cox NJ, et al. Association testing of the positional and functional candidate gene SLC1A1/EAAC1 in early-onset obsessive-compulsive disorder. Arch Gen Psychiatry. 2006;63(7):778–785. Shugart YY, Wang Y, Samuels JF, et al. A family-based association study of the glutamate transporter gene SLC1A1 in obsessive-compulsive disorder in 378 families. Am J Med Genet B Neuropsychiatr Genet. 2009;150B(6):886–892. Stewart SE, Mayerfeld C, Arnold PD, et al. Meta-analysis of association between obsessive-compulsive disorder and the 3′ region of neuronal glutamate transporter gene SLC1A1. Am J Med Genet B Neuropsychiatr Genet. 2013;162B(4):367–379. Arnold PD, Macmaster FP, Richter MA, et al. Glutamate receptor gene (GRIN2B) associated with reduced anterior cingulate glutamatergic concentration in pediatric obsessive-compulsive disorder. Psychiatry Res. 2009;172(2):136–139. Alonso P, Gratacós M, Segalàs C, et al. Association between the NMDA glutamate receptor GRIN2B gene and obsessive-compulsive disorder. J Psychiatry Neurosci. 2012;37(4):273–281. Tükel R, Ozata B, Oztürk N, Ertekin BA, Ertekin E, Direskeneli GS. The role of the brain-derived neurotrophic factor SNP rs2883187 in the phenotypic expression of obsessive-compulsive disorder. J Clin Neurosci. 2014;21(5):790–793. Márquez L, Camarena B, Hernández S, Lóyzaga C, Vargas L, Nicolini H. Association study between BDNF gene variants and Mexican patients with obsessive-compulsive disorder. Eur Neuropsychopharmacol. 2013;23(11):1600–1605. Tükel R, Gürvit H, Ozata B, et al. Brain-derived neurotrophic factor gene Val66Met polymorphism and cognitive function in obsessive-compulsive disorder. Am J Med Genet B Neuropsychiatr Genet. 2012; 159B(7):850–858. Greenberg BD, Ziemann U, Corá-Locatelli G, et al. Altered cortical excitability in obsessive-compulsive disorder. Neurology. 2000;54(1):142–147. Pittenger C, Krystal JH, Coric V. Glutamate-modulating drugs as novel pharmacotherapeutic agents in the treatment of obsessive-compulsive disorder. NeuroRx. 2006;3(1):69–81. Nicolas LB, Kolb Y, Prinssen EP. A combined marble burying-locomotor activity test in mice: a practical screening test with sensitivity to different classes of anxiolytics and antidepressants. Eur J Pharmacol. 2006;547(1–3):106–115. Shimazaki T, Iijima M, Chaki S. Anxiolytic-like activity of MGS0039, a potent group II metabotropic glutamate receptor antagonist, in a marble-burying behavior test. Eur J Pharmacol. 2004;501(1–3):121–125. Welch JM, Lu J, Rodriguiz RM, et al. Cortico-striatal synaptic defects and OCD-like behaviours in Sapap3-mutant mice. Nature. 2007;448(7156):894–900. Chen M, Wan Y, Ade K, Ting J, Feng G, Calakos N. Sapap3 deletion anomalously activates short-term endocannabinoid-mediated synaptic plasticity. J Neurosci. 2011;31(26):9563–9573. Joel D, Avisar A. Excessive lever pressing following post-training signal attenuation in rats: a possible animal model of obsessive compulsive disorder? Behav Brain Res. 2001;123(1):77–87. Albelda N, Bar-On N, Joel D. The role of NMDA receptors in the signal attenuation rat model of obsessive-compulsive disorder. Psychopharmacology (Berl). 2010;210(1):13–24. Alves Galvão MG, Rocha Crispino Santos MA, Alves da Cunha AJ. Amantadine and rimantadine for influenza A in children and the elderly. Cochrane Database Syst Rev. 2008;(1):CD002745. Williams SE. Amantadine treatment following traumatic brain injury in children. Brain Inj. 2007;21(9):885–889. Drayton SJ, Davies K, Steinberg M, Leroi I, Rosenblatt A, Lyketsos CG. Amantadine for executive dysfunction syndrome in patients with dementia. Psychosomatics. 2004;45(3):205–209. Hosenbocus S, Chahal R. Amantadine: a review of use in child and adolescent psychiatry. J Can Acad Child Adolesc Psychiatry. 2013;22(1):55–60. Neagoe AD. Delirium with manic and psychotic features associated with amantadine. Gen Hosp Psychiatry. 2013;35(6):680. e7–e8. Pasquini M, Berardelli I, Biondi M. Amantadine augmentation for refractory obsessive-compulsive disorder: a case report. J Clin Psychopharmacol. 2010;30(1):85–86. Stryjer R, Budnik D, Ebert T, et al. Amantadine augmentation therapy for obsessive compulsive patients resistant to SSRIs-an open-label study. Clin Neuropharmacol. 2014;37(3):79–81. Myskiw JC, Izquierdo I, Furini CR. Modulation of the extinction of fear learning. Brain Res Bull. 2014;105:61–69. Norberg MM, Krystal JH, Tolin DF. A meta-analysis of D-cycloserine and the facilitation of fear extinction and exposure therapy. Biol Psychiatry. 2008;63(12):1118–1126. Lee H, Kim JJ. Amygdalar NMDA receptors are critical for new fear learning in previously fear-conditioned rats. J Neurosci. 1998;18(20):8444–8454. Hofmann SG, Pollack MH, Otto MW. Augmentation treatment of psychotherapy for anxiety disorders with D-cycloserine. CNS Drug Rev. 2006;12(3–4):208–217. Kushner MG, Kim SW, Donahue C, et al. D-cycloserine augmented exposure therapy for obsessive-compulsive disorder. Biol Psychiatry. 2007;62(8):835–838. Wilhelm S, Buhlmann U, Tolin DF, et al. Augmentation of behavior therapy with D-cycloserine for obsessive-compulsive disorder. Am J Psychiatry. 2008;165(3):335–341; quiz 409. Storch EA, Merlo LJ, Bengtson M, et al. D-cycloserine does not enhance exposure-response prevention therapy in obsessive-compulsive disorder. Int Clin Psychopharmacol. 2007;22(4):230–237. Rodrigues H, Figueira I, Lopes A, et al. Does D-cycloserine enhance exposure therapy for anxiety disorders in humans? A meta-analysis. PLoS One. 2014;9(7):e93519. Hernandes MS, Troncone LR. Glycine as a neurotransmitter in the forebrain: a short review. J Neural Transm. 2009;116(12):1551–1560. Clements JD, Westbrook GL. Activation kinetics reveal the number of glutamate and glycine binding sites on the N-methyl-D-aspartate receptor. Neuron. 1991;7(4):605–613. Labrie V, Roder JC. The involvement of the NMDA receptor D-serine/glycine site in the pathophysiology and treatment of schizophrenia. Neurosci Biobehav Rev. 2010;34(3):351–372. Greenberg WM, Benedict MM, Doerfer J, et al. Adjunctive glycine in the treatment of obsessive-compulsive disorder in adults. J Psychiatr Res. 2009;43(6):664–670. Caddy C, Giaroli G, White TP, Shergill SS, Tracy DK. Ketamine as the prototype glutamatergic antidepressant: pharmacodynamic actions, and a systematic review and meta-analysis of efficacy. Ther Adv Psychopharmacol. 2014;4(2):75–99. Rodriguez CI, Kegeles LS, Flood P, Simpson HB. Rapid resolution of obsessions after an infusion of intravenous ketamine in a patient with treatment-resistant obsessive-compulsive disorder. J Clin Psychiatry. 2011;72(4):567–569. Bloch MH, Wasylink S, Landeros-Weisenberger A, et al. Effects of ketamine in treatment-refractory obsessive-compulsive disorder. Biol Psychiatry. 2012;72(11):964–970. Rodriguez CI, Kegeles LS, Levinson A, et al. Randomized controlled crossover trial of ketamine in obsessive-compulsive disorder: proof-of-concept. Neuropsychopharmacology. 2013;38(12):2475–2483. Xie X, Hagan RM. Cellular and molecular actions of lamotrigine: Possible mechanisms of efficacy in bipolar disorder. Neuropsychobiology. 1998;38(3):119–130. Cunningham MO, Jones RS. The anticonvulsant, lamotrigine decreases spontaneous glutamate release but increases spontaneous GABA release in the rat entorhinal cortex in vitro. Neuropharmacology. 2000;39(11):2139–2146. Burstein AH. Lamotrigine. Pharmacotherapy. 1995;15(2):129–143. Ketter TA, Manji HK, Post RM. Potential mechanisms of action of lamotrigine in the treatment of bipolar disorders. J Clin Psychopharmacol. 2003;23(5):484–495. Bowden CL, Calabrese JR, Sachs G, et al; Lamictal 606 Study Group. A placebo-controlled 18-month trial of lamotrigine and lithium maintenance treatment in recently manic or hypomanic patients with bipolar I disorder. Arch Gen Psychiatry. 2003;60(4):392–400. Calabrese JR, Suppes T, Bowden CL, et al. A double-blind, placebo-controlled, prophylaxis study of lamotrigine in rapid-cycling bipolar disorder. Lamictal 614 Study Group. J Clin Psychiatry. 2000;61(11):841–850. Thomas SP, Nandhra HS, Jayaraman A. Systematic review of lamotrigine augmentation of treatment resistant unipolar depression (TRD). J Ment Health. 2010;19(2):168–175. Hertzberg MA, Butterfield MI, Feldman ME, et al. A preliminary study of lamotrigine for the treatment of posttraumatic stress disorder. Biol Psychiatry. 1999;45(9):1226–1229. Waldmeier PC, Baumann PA, Wicki P, Feldtrauer JJ, Stierlin C, Schmutz M. Similar potency of carbamazepine, oxcarbazepine, and lamotrigine in inhibiting the release of glutamate and other neurotransmitters. Neurology. 1995;45(10):1907–1913. Uzun O. Lamotrigine as an augmentation agent in treatment-resistant obsessive-compulsive disorder: a case report. J Psychopharmacol. 2010;24(3):425–427. Bruno A, Micò U, Pandolfo G, et al. Lamotrigine augmentation of serotonin reuptake inhibitors in treatment-resistant obsessive-compulsive disorder: a double-blind, placebo-controlled study. J Psychopharmacol. 2012;26(11):1456–1462. Erdö SL, Schäfer M. Memantine is highly potent in protecting cortical cultures against excitotoxic cell death evoked by glutamate and N-methyl-D-aspartate. Eur J Pharmacol. 1991;198(2–3):215–217. Kornhuber J, Weller M, Schoppmeyer K, Riederer P. Amantadine and memantine are NMDA receptor antagonists with neuroprotective properties. J Neural Transm Suppl. 1994;43:91–104. Emre M, Tsolaki M, Bonuccelli U, et al; 11018 Study Investigators. Memantine for patients with Parkinson’s disease dementia or dementia with Lewy bodies: a randomised, double-blind, placebo-controlled trial. Lancet Neurol. 2010;9(10):969–977. Cankurtaran ES, Ozalp E, Soygur H, Cakir A. Clinical experience with risperidone and memantine in the treatment of Huntington’s disease. J Natl Med Assoc. 2006;98(8):1353–1355. Tariot PN, Farlow MR, Grossberg GT, Graham SM, McDonald S, Gergel I; Memantine Study Group. Memantine treatment in patients with moderate to severe Alzheimer disease already receiving donepezil: a randomized controlled trial. JAMA. 2004;291(3):317–324. Hezel DM, Beattie K, Stewart SE. Memantine as an augmenting agent for severe pediatric OCD. Am J Psychiatry. 2009;166(2):237. Pasquini M, Biondi M. Memantine augmentation for refractory obsessive-compulsive disorder. Prog Neuropsychopharmacol Biol Psychiatry. 2006;30(6):1173–1175. Aboujaoude E, Barry JJ, Gamel N. Memantine augmentation in treatment-resistant obsessive-compulsive disorder: an open-label trial. J Clin Psychopharmacol. 2009;29(1):51–55. Feusner JD, Kerwin L, Saxena S, Bystritsky A. Differential efficacy of memantine for obsessive-compulsive disorder vs generalized anxiety disorder: an open-label trial. Psychopharmacol Bull. 2009;42(1):81–93. Ghaleiha A, Entezari N, Modabbernia A, et al. Memantine add-on in moderate to severe obsessive-compulsive disorder: randomized double-blind placebo-controlled study. J Psychiatr Res. 2013;47(2):175–180. Blumstein CG. Drug treatment in bronchial asthma. Semin Drug Treat. 1973;2(4):385–401. Stey C, Steurer J, Bachmann S, Medici TC, Tramèr MR. 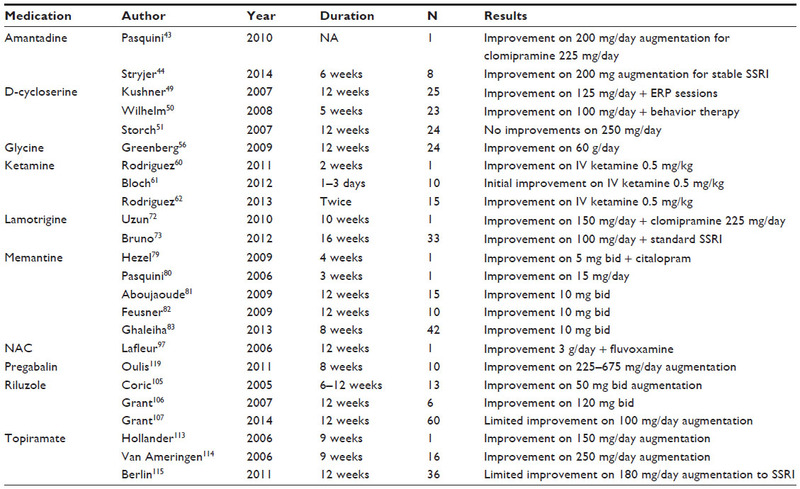 The effect of oral N-acetylcysteine in chronic bronchitis: a quantitative systematic review. Eur Respir J. 2000;16(2):253–262. Sadowska AM, Verbraecken J, Darquennes K, De Backer WA. Role of N-acetylcysteine in the management of COPD. Int J Chron Obstruct Pulmon Dis. 2006;1(4):425–434. Rumack BH. Acetaminophen overdose in children and adolescents. Pediatr Clin North Am. 1986;33(3):691–701. Kearns GL, Leeder JS, Wasserman GS. Acetaminophen intoxication during treatment: what you don’t know can hurt you. Clin Pediatr (Phila). 2000;39(3):133–144. Heard K, Green J. Acetylcysteine therapy for acetaminophen poisoning. Curr Pharm Biotechnol. 2012;13(10):1917–1923. Arica V, Demir IH, Tutanc M, et al. N-acetylcysteine prevents doxorubucine-induced cardiotoxicity in rats. Hum Exp Toxicol. 2013;32(6):655–661. Soltan-Sharifi MS, Mojtahedzadeh M, Najafi A, et al. Improvement by N-acetylcysteine of acute respiratory distress syndrome through increasing intracellular glutathione, and extracellular thiol molecules and anti-oxidant power: evidence for underlying toxicological mechanisms. Hum Exp Toxicol. 2007;26(9):697–703. Wu YJ, Muldoon LL, Neuwelt EA. The chemoprotective agent N-acetylcysteine blocks cisplatin-induced apoptosis through caspase signaling pathway. J Pharmacol Exp Ther. 2005;312(2):424–431. Orhan G, Yapici N, Yuksel M, et al. Effects of N-acetylcysteine on myocardial ischemia-reperfusion injury in bypass surgery. Heart Vessels. 2006;21(1):42–47. Borges-Santos MD, Moreto F, Pereira PC, Ming-Yu Y, Burini RC. Plasma glutathione of HIV+ patients responded positively and differently to dietary supplementation with cysteine or glutamine. Nutrition. 2012;28(7–8):753–756. Kandemir H, Abuhandan M, Aksoy N, Savik E, Kaya C. Oxidative imbalance in child and adolescent patients with obsessive compulsive disorder. J Psychiatr Res. 2013;47(11):1831–1834. Ersan S, Bakir S, Erdal Ersan E, Dogan O. Examination of free radical metabolism and antioxidant defence system elements in patients with obsessive-compulsive disorder. Prog Neuropsychopharmacol Biol Psychiatry. 2006;30(6):1039–1042. Lafleur DL, Pittenger C, Kelmendi B, et al. N-acetylcysteine augmentation in serotonin reuptake inhibitor refractory obsessive-compulsive disorder. Psychopharmacology (Berl). 2006;184(2):254–256. Wikke J. Riluzole. Lancet. 1996;348(9030):795–799. Jehle T, Bauer J, Blauth E, et al. Effects of riluzole on electrically evoked neurotransmitter release. Br J Pharmacol. 2000;130(6):1227–1234. Urbani A, Belluzzi O. Riluzole inhibits the persistent sodium current in mammalian CNS neurons. Eur J Neurosci. 2000;12(10):3567–3574. Sreedharan J, Brown RH Jr. Amyotrophic lateral sclerosis: problems and prospects. Ann Neurol. 2013;74(3):309–316. Clark W, Kendall MJ. Therapeutic advances: riluzole for the treatment of motor neurone disease. J Clin Pharm Ther. 1996;21(6):373–376. Gordon PH. Amyotrophic lateral sclerosis: an update for 2013 clinical features, pathophysiology, management and therapeutic trials. Aging Dis. 2013;4(5):295–310. Lacomblez L, Bensimon G, Leigh PN, et al; ALS Study Groups I and II. Long-term safety of riluzole in amyotrophic lateral sclerosis. Amyotroph Lateral Scler Other Motor Neuron Disord. 2002;3(1):23–29. Coric V, Taskiran S, Pittenger C, et al. Riluzole augmentation in treatment-resistant obsessive-compulsive disorder: an open-label trial. Biol Psychiatry. 2005;58(5):424–428. Grant P, Lougee L, Hirschtritt M, Swedo SE. An open-label trial of riluzole, a glutamate antagonist, in children with treatment-resistant obsessive-compulsive disorder. J Child Adolesc Psychopharmacol. 2007;17(6):761–767. Grant PJ, Joseph LA, Farmer CA, et al. 12-week, placebo-controlled trial of add-on riluzole in the treatment of childhood-onset obsessive-compulsive disorder. Neuropsychopharmacology. 2014;39(6):1453–1459. Garnett WR. Clinical pharmacology of topiramate: a review. Epilepsia. 2000;41 Suppl 1:S61–S65. Bauer J, Schwalen S. [Topiramate (Topamax). Pharmacological characteristics and current use in epilepsy treatment]. Nervenarzt. 2000;71(6):495–501. German. Poulsen CF, Simeone TA, Maar TE, Smith-Swintosky V, White HS, Schousboe A. Modulation by topiramate of AMPA and kainate mediated calcium influx in cultured cerebral cortical, hippocampal and cerebellar neurons. Neurochem Res. 2004;29(1):275–282. Manning S, Pucci A, Finer N. Pharmacotherapy for obesity: novel agents and paradigms. Ther Adv Chronic Dis. 2014;5(3):135–148. Linde M, Mulleners WM, Chronicle EP, McCrory DC. Topiramate for the prophylaxis of episodic migraine in adults. Cochrane Database Syst Rev. 2013;6:CD010610. Hollander E, Dell’Osso B. Topiramate plus paroxetine in treatment-resistant obsessive-compulsive disorder. Int Clin Psychopharmacol. 2006;21(3):189–191. Van Ameringen M, Mancini C, Patterson B, Bennett M. Topiramate augmentation in treatment-resistant obsessive-compulsive disorder: a retrospective, open-label case series. Depress Anxiety. 2006;23(1):1–5. Berlin HA, Koran LM, Jenike MA, et al. Double-blind, placebo-controlled trial of topiramate augmentation in treatment-resistant obsessive-compulsive disorder. J Clin Psychiatry. 2011;72(5):716–721. Ozkara C, Ozmen M, Erdogan A, Yalug I. Topiramate related obsessive-compulsive disorder. Eur Psychiatry. 2005;20(1):78–79. Lauria-Horner BA, Pohl RB. Pregabalin: a new anxiolytic. Expert Opin Investig Drugs. 2003;12(4):663–672. Micheva KD, Taylor CP, Smith SJ. Pregabalin reduces the release of synaptic vesicles from cultured hippocampal neurons. Mol Pharmacol. 2006;70(2):467–476. Oulis P, Mourikis I, Konstantakopoulos G. Pregabalin augmentation in treatment-resistant obsessive-compulsive disorder. Int Clin Psychopharmacol. 2011;26(4):221–224. Rampello L, Alvano A, Battaglia G, Bruno V, Raffaele R, Nicoletti F. Tic disorders: from pathophysiology to treatment. J Neurol. 2006;253(1):1–15. Specht MW, Nicotra CM, Kelly LM, et al. A Comparison of urge intensity and the probability of tic completion during tic freely and tic suppression conditions. Behav Modif. 2014;38(2):297–318. Woods DW, Piacentini JC, Scahill L, et al. Behavior therapy for tics in children: acute and long-term effects on psychiatric and psychosocial functioning. J Child Neurol. 2011;26(7):858–865. Wilhelm S, Peterson AL, Piacentini J, et al. Randomized trial of behavior therapy for adults with Tourette syndrome. Arch Gen Psychiatry. 2012;69(8):795–803. Rizzo R, Gulisano M. Clinical pharmacology of comorbid attention deficit hyperactivity disorder in Tourette syndrome. Int Rev Neurobiol. 2013;112:415–444. Neri V, Cardona F. Clinical pharmacology of comorbid obsessive-compulsive disorder in Tourette syndrome. Int Rev Neurobiol. 2013;112:391–414. Rizzo R, Gulisano M, Pellico A, Calì PV, Curatolo P. Tourette syndrome and comorbid conditions: a spectrum of different severities and complexities. J Child Neurol. 2014;29(10):1383–1389. Berardelli A, Currà A, Fabbrini G, Gilio F, Manfredi M. Pathophysiology of tics and Tourette syndrome. J Neurol. 2003;250(7):781–787. Singer HS, Minzer K. Neurobiology of Tourette’s syndrome: concepts of neuroanatomic localization and neurochemical abnormalities. Brain Dev. 2003;25 Suppl 1:S70–S84. Nomura Y, Segawa M. Neurology of Tourette’s syndrome (TS) TS as a developmental dopamine disorder: a hypothesis. Brain Dev. 2003; 25 Suppl 1:S37–S42. Yoon DY, Gause CD, Leckman JF, Singer HS. Frontal dopaminergic abnormality in Tourette syndrome: a postmortem analysis. J Neurol Sci. 2007;255(1–2):50–56. Udvardi PT, Nespoli E, Rizzo F, Hengerer B, Ludolph AG. Nondopaminergic neurotransmission in the pathophysiology of Tourette syndrome. Int Rev Neurobiol. 2013;112:95–130. Anderson GM, Pollak ES, Chatterjee D, Leckman JF, Riddle MA, Cohen DJ. Postmortem analysis of subcortical monoamines and amino acids in Tourette syndrome. Adv Neurol. 1992;58:123–133. Swerdlow NR, Sutherland AN. Using animal models to develop therapeutics for Tourette Syndrome. Pharmacol Ther. 2005;108(3):281–293. McGrath MJ, Campbell KM, Parks CR, Burton FH. Glutamatergic drugs exacerbate symptomatic behavior in a transgenic model of comorbid Tourette’s syndrome and obsessive-compulsive disorder. Brain Res. 2000;877(1):23–30. Nordstrom EJ, Burton FH. A transgenic model of comorbid Tourette’s syndrome and obsessive-compulsive disorder circuitry. Mol Psychiatry. 2002;7(6):617–625, 524. Shoemaker JM, Saint Marie RL, Bongiovanni MJ, Neary AC, Tochen LS, Swerdlow NR. Prefrontal D1 and ventral hippocampal N-methyl-D-aspartate regulation of startle gating in rats. Neuroscience. 2005;135(2):385–394. Abel KM, Allin MP, Hemsley DR, Geyer MA. Low dose ketamine increases prepulse inhibition in healthy men. Neuropharmacology. 2003;44(6):729–737. Duncan EJ, Madonick SH, Parwani A, et al. Clinical and sensorimotor gating effects of ketamine in normals. Neuropsychopharmacology. 2001;25(1):72–83. Ortiz A, Alda M, O’Donovan C. Tourette syndrome with comorbid bipolar disorder and migraine: can lamotrigine monotherapy help? J Clin Psychopharmacol. 2012;32(1):140–142. Seemüller F, Dehning S, Grunze H, Müller N. Tourette’s symptoms provoked by lamotrigine in a bipolar patient. Am J Psychiatry. 2006; 163(1):159. Lombroso CT. Lamotrigine-induced tourettism. Neurology. 1999; 52(6):1191–1194. Sotero de Menezes MA, Rho JM, Murphy P, Cheyette S. Lamotrigine-induced tic disorder: report of five pediatric cases. Epilepsia. 2000; 41(7):862–867. Fornaro M, Maremmani AG, Colicchio MG, et al. A case of severe oral self-injurious Tourette’s syndrome alleviated by pregabalin. Gen Hosp Psychiatry. 2012;34(3):321. e1–e4. Kuo SH, Jimenez-Shahed J. Topiramate in treatment of tourette syndrome. Clin Neuropharmacol. 2010;33(1):32–34. Jankovic J, Jimenez-Shahed J, Brown LW. A randomised, double-blind, placebo-controlled study of topiramate in the treatment of Tourette syndrome. J Neurol Neurosurg Psychiatry. 2010;81(1):70–73. Underhill SM, Wheeler DS, Li M, Watts SD, Ingram SL, Amara SG. Amphetamine modulates excitatory neurotransmission through endocytosis of the glutamate transporter EAAT3 in dopamine neurons. Neuron. 2014;83(2):404–416. Rolland B, Jardri R, Amad A, Thomas P, Cottencin O, Bordet R. Pharmacology of hallucinations: several mechanisms for one single symptom? Biomed Res Int. 2014;2014:307106. Taylor M, Bhagwandas K. N-acetylcysteine in trichotillomania: a panacea for compulsive skin disorders? Br J Dermatol. 2014;171(5):1253–1255. Van Ameringen M, Patterson B, Simpson W. DSM-5 obsessive-compulsive and related disorders: clinical implications of new criteria. Depress Anxiety. 2014;31(6):487–493. Masur D, Shinnar S, Cnaan A, et al; Childhood Absence Epilepsy Study Group. Pretreatment cognitive deficits and treatment effects on attention in childhood absence epilepsy. Neurology. 2013;81(18):1572–1580. Mallo M, Alonso CR. The regulation of Hox gene expression during animal development. Development. 2013;140(19):3951–3963. Panza KE, Pittenger C, Bloch MH. Age and gender correlates of pulling in pediatric trichotillomania. J Am Acad Child Adolesc Psychiatry. 2013;52(3):241–249. Bloch MH, Panza KE, Grant JE, Pittenger C, Leckman JF. N-Acetylcysteine in the treatment of pediatric trichotillomania: a randomized, double-blind, placebo-controlled add-on trial. J Am Acad Child Adolesc Psychiatry. 2013;52(3):231–240. Rodrigues-Barata AR, Tosti A, Rodríguez-Pichardo A, Camacho-Martínez F. N-acetylcysteine in the treatment of trichotillomania. Int J Trichology. 2012;4(3):176–178. Grant JE, Odlaug BL, Chamberlain SR, Keuthen NJ, Lochner C, Stein DJ. Skin picking disorder. Am J Psychiatry. 2012;169(11):1143–1149. Schneebaum-Sender N, Goldberg-Stern H, Fattal-Valevski A, Kramer U. Does a normalizing electroencephalogram in benign childhood epilepsy with centrotemporal spikes abort attention deficit hyperactivity disorder? Pediatr Neurol. 2012;47(4):279–283. Wu J, Xiao H, Sun H, Zou L, Zhu LQ. Role of dopamine receptors in ADHD: a systematic meta-analysis. Mol Neurobiol. 2012;45(3):605–620. Grant JE, Odlaug BL, Chamberlain SR. A cognitive comparison of pathological skin picking and trichotillomania. J Psychiatr Res. 2011;45(12):1634–1638. Chamberlain SR, Hampshire A, Menzies LA, et al. Reduced brain white matter integrity in trichotillomania: a diffusion tensor imaging study. Arch Gen Psychiatry. 2010;67(9):965–971. Grant JE, Odlaug BL, Chamberlain SR, Kim SW. A double-blind, placebo-controlled trial of lamotrigine for pathological skin picking: treatment efficacy and neurocognitive predictors of response. J Clin Psychopharmacol. 2010;30(4):396–403. Grant JE, Odlaug BL, Kim SW. N-acetylcysteine, a glutamate modulator, in the treatment of trichotillomania: a double-blind, placebo-controlled study. Arch Gen Psychiatry. 2009;66(7):756–763. Chamberlain SR, Odlaug BL, Boulougouris V, Fineberg NA, Grant JE. Trichotillomania: neurobiology and treatment. Neurosci Biobehav Rev. 2009;33(6):831–842. Paine TA, Neve RL, Carlezon WA Jr. Attention deficits and hyperactivity following inhibition of cAMP-dependent protein kinase within the medial prefrontal cortex of rats. Neuropsychopharmacology. 2009;34(9):2143–2155. Tseng KY, O’Donnell P. Dopamine-glutamate interactions controlling prefrontal cortical pyramidal cell excitability involve multiple signaling mechanisms. J Neurosci. 2004;24(22):5131–5139. MacMaster FP, Carrey N, Sparkes S, Kusumakar V. Proton spectroscopy in medication-free pediatric attention-deficit/hyperactivity disorder. Biol Psychiatry. 2003;53(2):184–187. Carrey N, MacMaster FP, Fogel J, et al. Metabolite changes resulting from treatment in children with ADHD: a 1H-MRS study. Clin Neuropharmacol. 2002;26(4):218–221. Bush G, Luu P, Posner MI. Cognitive and emotional influences in anterior cingulate cortex. Trends Cogn Sci. 2000;4(6):215–222. Xu M, Moratalla R, Gold LH, et al. Dopamine D1 receptor mutant mice are deficient in striatal expression of dynorphin and in dopamine-mediated behavioral responses. Cell. 1994;79(4):729–742. Granon S, Passetti F, Thomas KL, Dalley JW, Everitt BJ, Robbins TW. Enhanced and impaired attentional performance after infusion of D1 dopaminergic receptor agents into rat prefrontal cortex. J Neurosci. 2000;20(3):1208–1215. Warton FL, Howells FM, Russell VA. Increased glutamate-stimulated release of dopamine in substantia nigra of a rat model for attention-deficit/hyperactivity disorder – lack of effect of methylphenidate. Metab Brain Dis. 2009;24(4):599–613. Miller JL, Angulo M. An open-label pilot study of N-acetylcysteine for skin-picking in Prader-Willi syndrome. Am J Med Genet A. 2014;164A(2):421–424. Lesch KP, Merker S, Reif A, Novak M. Dances with black widow spiders: dysregulation of glutamate signalling enters centre stage in ADHD. Eur Neuropsychopharmacol. 2013;23(6):479–491. Elia J, Glessner JT, Wang K, et al. Genome-wide copy number variation study associates metabotropic glutamate receptor gene networks with attention deficit hyperactivity disorder. Nat Genet. 2012;44(1):78–84. Rubinstein M, Cepeda C, Hurst RS, et al. Dopamine D4 receptor-deficient mice display cortical hyperexcitability. J Neurosci. 2001;21(11):3756–3763. Wang X, Zhong P, Gu Z, Yan Z. Regulation of NMDA receptors by dopamine D4 signaling in prefrontal cortex. J Neurosci. 2003;23(30):9852–9861. Gan L, Falzone TL, Zhang K, Rubinstein M, Baldessarini RJ, Tarazi FI. Enhanced expression of dopamine D(1) and glutamate NMDA receptors in dopamine D(4) receptor knockout mice. J Mol Neurosci. 2004;22(3):167–178. Thomas TC, Grandy DK, Gerhardt GA, Glaser PE. Decreased dopamine D4 receptor expression increases extracellular glutamate and alters its regulation in mouse striatum. Neuropsychopharmacology. 2009;34(2):436–445. Pozzi L, Baviera M, Sacchetti G, et al. Attention deficit induced by blockade of N-methyl D-aspartate receptors in the prefrontal cortex is associated with enhanced glutamate release and cAMP response element binding protein phosphorylation: role of metabotropic glutamate receptors 2/3. Neuroscience. 2011;176:336–348. Viggiano D, Vallone D, Welzl H, Sadile AG. The Naples High- and Low-Excitability rats: selective breeding, behavioral profile, morphometry, and molecular biology of the mesocortical dopamine system. Behav Genet. 2002;32(5):315–333. Ruocco LA, Gironi Carnevale UA, Sadile AG, et al. Elevated forebrain excitatory L-glutamate, L-aspartate and D-aspartate in the Naples high-excitability rats. Behav Brain Res. 2009;198(1):24–28. Mattes J. A pilot trial of amantadine in hyperactive children. Psychopharmacol Bull. 1980;16(3):67–69. Donfrancesco R, Calderoni D, Vitiello B. Open-label amantadine in children with attention-deficit/hyperactivity disorder. J Child Adolesc Psychopharmacol. 2007;17(5):657–664. Mohammadi MR, Kazemi MR, Zia E, Rezazadeh SA, Tabrizi M, Akhondzadeh S. Amantadine versus methylphenidate in children and adolescents with attention deficit/hyperactivity disorder: a randomized, double-blind trial. Hum Psychopharmacol. 2010;25(7–8):560–565. Öncü B, Er O, Çolak B, Nutt DJ. Lamotrigine for attention deficit-hyperactivity disorder comorbid with mood disorders: a case series. J Psychopharmacol. 2014;28(3):282–283. Uvebrant P, Bauzienè R. Intractable epilepsy in children. The efficacy of lamotrigine treatment, including non-seizure-related benefits. Neuropediatrics. 1994;25(6):284–289. Schubert R. Attention deficit disorder and epilepsy. Pediatr Neurol. 2005;32(1):1–10. Peeters M, Maloteaux JM, Hermans E. Distinct effects of amantadine and memantine on dopaminergic transmission in the rat striatum. Neurosci Lett. 2003;343(3):205–209. Findling RL, McNamara NK, Stansbrey RJ, et al. A pilot evaluation of the safety, tolerability, pharmacokinetics, and effectiveness of memantine in pediatric patients with attention-deficit/hyperactivity disorder combined type. J Child Adolesc Psychopharmacol. 2007;17(1):19–33. Surman CB, Hammerness PG, Petty C, et al. A pilot open label prospective study of memantine monotherapy in adults with ADHD. World J Biol Psychiatry. 2013;14(4):291–298. Garcia RJ, Francis L, Dawood M, Lai ZW, Faraone SV, Perl A. Attention deficit and hyperactivity disorder scores are elevated and respond to N-acetylcysteine treatment in patients with systemic lupus erythematosus. Arthritis Rheum. 2013;65(5):1313–1318. Arnold LM, Auchenbach MB, McElroy SL. Psychogenic excoriation. Clinical features, proposed diagnostic criteria, epidemiology and approaches to treatment. CNS Drugs. 2001;15(5):351–359. Keuthen NJ, Koran LM, Aboujaoude E, Large MD, Serpe RT. The prevalence of pathologic skin picking in US adults. Compr Psychiatry. 2010;51(2):183–186. Hayes SL, Storch EA, Berlanga L. Skin picking behaviors: An examination of the prevalence and severity in a community sample. J Anxiety Disord. 2009;23(3):314–319. Swedo SE, Rapoport JL. Annotation: trichotillomania. J Child Psychol Psychiatry. 1991;32(3):401–409. Neziroglu F, Rabinowitz D, Breytman A, Jacofsky M. Skin picking phenomenology and severity comparison. Prim Care Companion J Clin Psychiatry. 2008;10(4):306–312. Bohne A, Savage CR, Deckersbach T, Keuthen NJ, Wilhelm S. Motor inhibition in trichotillomania and obsessive-compulsive disorder. J Psychiatr Res. 2008;42(2):141–150. Swedo SE, Rapoport JL, Leonard HL, Schapiro MB, Rapoport SI, Grady CL. Regional cerebral glucose metabolism of women with trichotillomania. Arch Gen Psychiatry. 1991;48(9):828–833. Roos A, Fouche JP, Stein DJ, Lochner C. White matter integrity in hair-pulling disorder (trichotillomania). Psychiatry Res. 2013;211(3):246–250. Grant JE, Odlaug BL, Hampshire A, Schreiber LR, Chamberlain SR. White matter abnormalities in skin picking disorder: a diffusion tensor imaging study. Neuropsychopharmacology. 2013;38(5):763–769. Stratford TH, Kostakopoulou K, Maden M. Hoxb-8 has a role in establishing early anterior-posterior polarity in chick forelimb but not hindlimb. Development. 1997;124(21):4225–4234. Welch JM, Wang D, Feng G. Differential mRNA expression and protein localization of the SAP90/PSD-95-associated proteins (SAPAPs) in the nervous system of the mouse. J Comp Neurol. 2004;472(1):24–39. Bienvenu OJ, Wang Y, Shugart YY, et al. Sapap3 and pathological grooming in humans: Results from the OCD collaborative genetics study. Am J Med Genet B Neuropsychiatr Genet. 2009;150B(5):710–720. Züchner S, Wendland JR, Ashley-Koch AE, et al. Multiple rare SAPAP3 missense variants in trichotillomania and OCD. Mol Psychiatry. 2009;14(1):6–9. Odlaug BL, Grant JE. N-acetyl cysteine in the treatment of grooming disorders. J Clin Psychopharmacol. 2007;27(2):227–229. Grant JE, Odlaug BL, Kim SW. Lamotrigine treatment of pathologic skin picking: an open-label study. J Clin Psychiatry. 2007;68(9):1384–1391. Lochner C, Seedat S, Niehaus DJ, Stein DJ. Topiramate in the treatment of trichotillomania: an open-label pilot study. Int Clin Psychopharmacol. 2006;21(5):255–259. Shapira NA, Lessig MC, Murphy TK, Driscoll DJ, Goodman WK. Topiramate attenuates self-injurious behaviour in Prader-Willi Syndrome. Int J Neuropsychopharmacol. 2002;5(2):141–145. Jafferany M, Shireen F, Ibrahim A. An open-label trial of topiramate in the treatment of skin picking in pervasive developmental disorder not otherwise specified. Prim Care Companion J Clin Psychiatry. 2010;12(2). pii: PCC.09l00829. Coric V, Kelmendi B, Pittenger C, Wasylink S, Bloch MH, Green J. Beneficial effects of the antiglutamatergic agent riluzole in a patient diagnosed with trichotillomania. J Clin Psychiatry. 2007;68(1):170–171. Rothman SM, Mattson MP. Activity-dependent, stress-responsive BDNF signaling and the quest for optimal brain health and resilience throughout the lifespan. Neuroscience. 2013;239:228–240. Tanaka K. [Brain development and glutamate]. Brain Nerve. 2013;65(10):1121–1132. Japanese. Nakamichi N, Takarada T, Yoneda Y. Neurogenesis mediated by gamma-aminobutyric acid and glutamate signaling. J Pharmacol Sci. 2009;110(2):133–149.